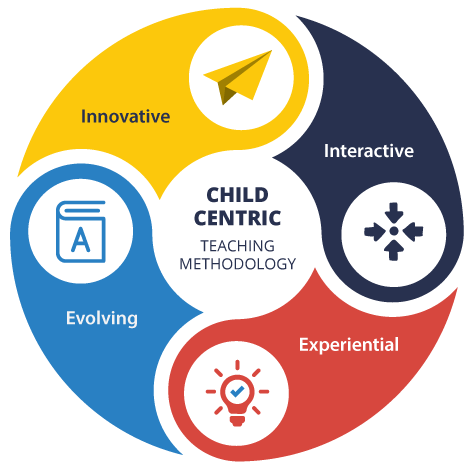 SEL Schools are emphatic about providing child-centric education, and keeping this in mind, we offer learning that is both interactive and experiential. Teaching methodology in our schools is a diverse mix of the most recent innovations in education and is based on the latest findings in tutoring research. We realize that a single method cannot suit everyone. Our educators select the best combination of various approaches according to the learning styles and needs of their students. Our Shri Shikshaks act as facilitators and guide the students in their learning using activities, audio-visual stimuli, projects and presentations. The focus remains on creating awareness in the students and providing them with hands-on learning experiences that they can apply to real-life situations. Kindergarten is the first experience of the child in a structured setting with teachers and groups of children. The curriculum for Pre Primary - Nursery, KG1 and KG2 would be play-based and child centered, recognizing the students’ multiple intelligences and encouraging creative thinking. A day at the Pre-Primary would involve much free play, both indoors and outdoors, and structured time. Indoor free play would be based around a series of activities such as Dramatic Play, Sensorial Learning, Choice Time Activities, Role Play, Art and Discovery Hour/Wonder Time. Primary School would cover a period of five years - Grade I to V, during which the basic skills in all subjects would further be enhanced and higher-level skills would be introduced to challenge students and stimulate their interest. Primary School curriculum focusses on the spirit of exploration and acquiring sound language skills, clarity of mathematical concepts and understanding of scientific concepts. Research, analysis and sythesis are focus points during these years. Learning is enriched by several activities like drama, storytelling, poetry, music, I.T., discussions and a wide range of artistic and hands on activities. Along with the essential Scholastic areas, the rich and varied Co- Scholastic program would include exchange programs, educational trips and community service. The Senior School – Grades IX to XII, would follow the prescribed board syllabus. To cater to the 21st Century learners, exploration, innovative problem solving, independent expression and decision-making are actively encouraged. Students become informed, confident and active learners with a strong sense of self. The school prepare students to face the challenges of the future by creating education programmes relevant to today's world. As the students enter their middle years of schooling (Grades VI to VIII), our schools that offer National Curriculum may be affiliated to any one of the following examination boards and accordingly the syllabus, assessment pattern and general practices as prescribed by the board would be mandated in these forms. CBSE (Central Board of Secondary Education) - The CBSE curriculum is designed and developed by the National Council of Educational Research and Training, New Delhi. It prepares students for the All India CBSE Secondary Schools Examination at age 16 (end of grade X) and the All India Senior School Certificate Examination at age 18 (end of grade XII). The official website of cbse ( www.cbse.nic.in ) regularly publishes to all its schools the detailed syllabus of the year for Grades IX to XII. CISCE (Council for the Indian School Certificate Examinations) -The Council publishes all the details of the curriculum on its official website ( www.cisce.org ). The CISCE curriculum prepares students for the ICSE examination in secondary school at age 16 (end of Grade X) and the ISC (Indian School Certificate) examination in the final year of senior secondary school at age 18 (end of Grade XII).